With back workouts you quickly learn a truism, all of the wide grip chins and pull-downs in the world can't give you a fully developed, ripped back. For that, you must do your heavy rows, especially close grip. However, the problem with those exercises (heavy low pulley rows, T-bar rows and medium grip bent over barbell rows) is that they put an enormous load on the lower back. Now, with BACKBULL lat workouts in any smith machine you experience incredible gains for heavy rowing with no lower back loading. Nothing seems to match the "OLD SCHOOL" feel of body weight exercises, no matter if it's dips, wide grip chins, or BACKBULL rows. Simply put, "they are all brutal, effective exercises". And even if you have never had low back injuries, after a few sets, BACKBULL will become one of your "go to" rowing movements on back day. 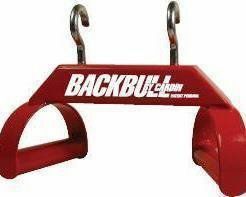 The BACKBULL itself is only part of a system with SHOULDER BACKBULL (patent pending), and accessories, coming in mid-summer 2011. BACKBULL is "overbuilt" for strength, and proudly made in the USA, welded robotically in an ISO 9001 Certified Factory.